This Park City family wanted to increase the comfort of their home by integrating single-touch control throughout. Using Control4, a smart home system now offers single-touch control of the lights, A/V, security, and comfort in nearly 30 rooms. Fully equipped with 100+ speakers, 260 TVs, and 42 miles of wire, this facility in Midvale, Utah is the 27th Topgolf to swing through the U.S. It’s “like a digital driving range,” says a Yelp review. Montage Deer Valley and Control4 combine the very best in comfort, luxury, and convenience. For Greg Windisch, from the moment he found this secluded slice of wooded heaven, it was about slowly but surely transforming it into something of his very own—a space that both worked in harmony with the forested environment and yet equally complemented his lifestyle, which means, yes, just as air is to the bird, a decent dose of technology was needed for Greg’s vision. Gone are the days, it seems, of the “shoe box” modular home. Companies like Irontown Homes use designers and architects to truly customize a homebuyer’s plan. “As long as it can be broken down into pieces and moved down the road, we can put it together..."
With personal experience with both a child who has autism and what home automation is capable of, Mark engineered his house to make everyday life with three and-a-half-year-old Brody a little easier. One-touch buttons and preprogrammed scenes do everything from help him start his day with a smile, engage harmoniously with his therapist and one creative application has even helped curb a new development of Brody leaving the house unannounced. Alas, have you ever been to one of those psychological thriller movies where things are too perfect? The type where there’s something subtly amiss with the flawless house, town, family or friend in spite of all outward appearances? Spring is like that for a homeowner. Is your yard ready for your next celebration or staycation? Spring is here and summer is just around the corner. Is your yard ready for alfresco dining, barbecues, and poolside parties? You’ll need three basic ingredients to cook up a memorable shindig; good company, good grub, and good music. But why simply settle for good music when you can have incredible, full coverage sound that is sure to get your guests groovin’? 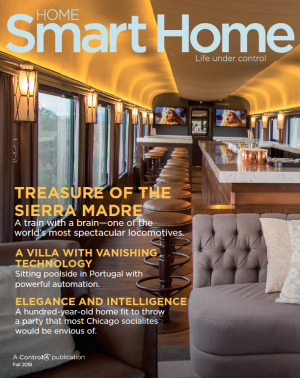 ...The benefits of having a smart home system installed go beyond safety and convenience. Another benefit you may not be aware of is the potential to receive home insurance discounts for installing smart home technology. Finding a dealer with skills you can trust is key to enjoying a superior smart home experience. Smart home or not, any homeowner who experiences an internet outage knows what an irritating inconvenience it can be to be abruptly jolted back into the dark ages. Just about all of our modern luxuries, and even our home security systems, are now dependent on connectivity. This means that the more technology your home has, the more important it is that your network performs at its peak. But not all networks are built the same, because not all technology integrators are the same. Homeowners everywhere are reaping the benefits of a professionally-installed smart home system coupled with the ability to do a lot of customization all on their own. Here are a few ways they are using When >> Then to personalize what happens at home. Last year, Super Bowl L1 pulled in 111.9 million viewers. When the New England Patriots made their Super Bowl appearance in 2015, the record for the largest audience in TV history was set with 114.4 million viewers. Whether you're a life-long gridiron fan, you're just watching to see the latest Doritos commercial, or you’re in it to see Justin Timberlake's halftime performance, it's safe to say the odds are high that you'll be watching the big game on Sunday. Like any technology, smart devices designed for use in the home exist in a constant state of evolution. New developments in electronics, circuitry, and software have enabled devices to become increasingly intelligent, fast, and affordable, and to perform tasks that were once unimaginable. The home of the future has arrived, thanks in large part to state-of-the-art automation accessories. These “smart” devices can transform an ordinary house into one with improved energy efficiency, safety, and privacy (while making daily tasks a lot more convenient and fun). From controlling your home’s temperature, lighting, and security system, to making it all work together with just a simple voice command, here’s a look at five must-have smart home accessories. You could “spring” into frenetic activity every March or April to maintain and improve your home’s safety and appearance. Or, if you prefer a less stressful approach, consider accomplishing a few routine tasks every month for added benefits. Use the checklist of home maintenance basics below to keep your house clean, safe, and secure, as well as save on monthly utility bills. It may have taken a while, but after researching your options from some of the world's leading smart home brands, you've finally decided that Control4 home automation system is the way to go. Now there's just one crucial question left to answer: Which Control4 dealer will you work with to supply, install, and ultimately maintain that system? From smart thermostats to automated lighting and everything in between, there's no question that innovative, Internet-enabled technology can make a home more fun, convenient and safe. What you may not know, however, is that it also represents a potentially valuable investment.